I had the pleasure of interviewing Marisel Salazar. Marisel is a New York City-based food and travel writer, for PureWow, Tasting Table, Eater, NYCGO, VinePair and many more. 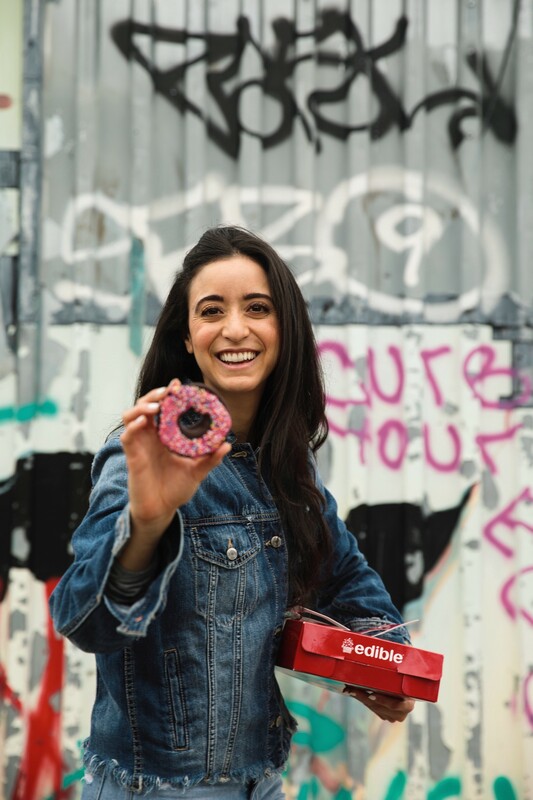 She was featured as one of Refinery29’s Top NYC Food Instagrams to follow this year, was included as a Zagat Top 100 Instagram to Follow, in addition to features from Taste Talks and The New Potato. She also produces culinary events and neighborhood dining guides with James Beard award-winning, Michelin-starred, and up-and-coming chefs across the US like Jessi Singh of Babu Ji, Erik Bruner-Yang of Maketto, and Carrie and Rupert Blease of Lord Stanley. She consults for many brands and specializing in trends and trend forecasting. @BreadButterNYC is her personal food Instagram account, with over 21k+ followers which documents her culinary and editorial related projects. Losing my job in 2014 couldn’t have been a bigger blessing. I was a bored web analyst for a health insurance treatment advisory firm in Washington, D.C. (yawn). I went to school for communication and nutrition, but food was my first love. I took cooking courses, wine tasting classes, and held dinner parties on the weekends. I studied in Madrid for the food. A shopping spree to me was a trip to the grocery store. A restaurant visit was what I looked forward to on the weekends. While working as a web analyst in Washington, D.C., I began freelance writing for small publications and blogs. I moved to New York City while still working as a web analyst and began @BreadButterNYC. I’d sneak off at lunch to interview chefs for stories and take photos. During the evenings and weekends, I worked as a chef’s assistant. My writing and social media began drumming up an interest- and followers. Growing up in a single parent household (single mother, never knew my father), with both my mother and my sister having safe and secure government jobs, I was too timid to fully pursue food writing. It seemed too risky, too unpredictable to intentionally pursue after my whole childhood was shaped to go to an Ivy League school and find a job that would pay into a 401k, mortgage, and benefits. THAT was the dream. Not mine though. Losing my job was exactly the push I needed to pursue a life of food. “Failure is not an option,” I told (tell) myself. Now, I am honored to write for various top-tier publications, consult for brands I respect, and share my life with 21k+ followers and counting. Food waste (well, curbing it) is near and dear to my heart. As a food writer and influencer, I am surrounded by obscene amounts of food everyday (#blessed). But at one point in my life, I was living off a fixed income and only spent $28 a week on groceries. Now, I’m served more food than I could ever possibly eat (again, not complaining). Americans waste 150,000 tons of food each day — equal to a pound per person. Imagine how many people we could feed if we found a way to utilize this good food. An eventual goal of mine is to be able to start or contribute to a non-profit that works with restaurants and grocery stores to reduce food waste and connect them with shelters and the needy in a safe and efficient manner. I called the CFO of Coca Cola on my first day of my first job out of college. I worked as a measly business development associate (read: sub sales rep, bottom-of-the-totem-pole type person), cold-calling C-level executives at Fortune 500 companies securing meetings for more revered sales executives who got all the glory. After a bumbling phone call, I got the meeting. I was great at my job. And I hated my job. I was great at it because: I targeted a wide territory, always followed up, and never stopped pitching. I was also paid bonuses if I went over quota. I’d lose my job if I went under. So, I was very “inspired” to hustle. Like a door-to-door salesman, never stop promoting yourself and pitching yourself as far and wide as possible. For as much as I disliked sales, the lessons were the same when I became self-employed and began reaching out to editors at publications I wanted to write for. Know your product, aka YOU before you sell it. You are a product or service. Recognize what you have (and don’t have) to offer a brand, company, person or publication you want to work with. I didn’t start out writing for top-tier publications. I began with very small outlets and blogs and worked my up, while simultaneously working on @breadbutternyc, and growing my consulting portfolio. I’ve never put my eggs all in one basket. I also recognized that the particular nature of my work was very different from my friends and family who worked 9–5 structured jobs with steady pay and benefits. I worked (and still do) odd hours and around the clock. I don’t adhere to a box. This type of lifestyle might not work for some people, but I’m okay (happy!) spending a Saturday afternoon writing a story while others are out recovering from drunk brunch. Drunk brunch doesn’t bring my joy — but writing, interviewing, eating, and traveling do. I am content with living my life all days of the week, not just evenings and weekends. I don’t like my time being held hostage. Todd Kliman, food editor for the Washingtonian. When I was a senior at Cornell University, agonizing over the type of life and career I wanted (as a food writer, but having no idea how to go about it and make a living), I decided to throw spaghetti against the wall and reach out to one of my favorite food writers, Todd Kliman. I hunted for his contact information, sent him a note asking if he would please share some advice, and figured I would never hear from him. In essence, what he was telling me was that being a food writer was going be a very unconventional path with lots of hardships and ‘no’s.’ But if I truly wanted to work in food, I’d have to supersede all the no’s anyways and press on. I like to think I did and am still doing that. In addition to begin writing for Michelin and INSIDER, I am starting my track as an on-camera host and personality. I have a few pilots and series in the works that I hope to share soon! Make sure you have a clear Media Kit or rate sheet ready. Break down the “services” you offer such as an Instagram post, tweet, blog post, etc. and associate a price with it. Make sure to include a short bio, photo, relevant websites and social media handles in this well-designed one or two-pager document. It is worth investing in a graphic designer to help you with this collateral if you cannot design something professional yourself (it should be a one time cost for the template and well-worth it). This shows the brands that you are a serious business with proper collateral and should be treated like one. Provide case studies. If a brand you want to work with balks at your rates or needs some convincing to work with you, share a case study. This could be any brand you’ve worked with before and highlights a high-level breakdown of the services provided, the ROI, and analytics in a short 1–3 page deck. Content creation. Many brands are looking for content creators. If you don’t have the following (yet!) to have brands pay you for posts, offer to create content (at a price of course!) for them. But again, you will have to demonstrate that you have the technical and creative skills to show the brand in addition to your social media profiles or blogs. This is where a Media Kit, case studies, and online portfolio come in. Do not provide marketing in exchange for product. In very few cases, I never guarantee a post on my social media without some type of compensation. Unless you are just starting out, associate any brand requests for post promoting their product on your social media or blog platforms with a price — however small. Unless you are a close friend of mine or charity I care about (or brand I REALLY want to work with), I do not “give away” my “work” for free. I think about it this way: Someone is requesting marketing and promotional services from me. This is work. I have to spend time and labor to produce my content. This is work. Unless there is some sort of mutually beneficial services or product swap that works for both parties, no amount of “small business” or “start-up without a budget” will change the fact that someone is asking work from me. I too am a small-business. I am also a woman-owned, minority small-business at that. If this brand or company is looking to generate money off of you, you should be getting paid. You better bet they sure are. Establish your niche. It’s easy to get bombarded with product requests and promotion from lots of brands. But do they make sense for your personal brand? If not immediately obvious, than could a cross-over with a seemingly unrelated industry work? Your audience will see right through any sponsored posts that just don’t fit (and they are what helps you get paid in the first place!). It is also helpful to establish a “product or service history” so that your followers don’t just see a #sponsored post out of the blue. I work with a variety of brands and industries, from spirits/alcohol, fitness, hotel, to food and more. It is a pretty wide spectrum, but all make sense for my brand because I have an established social and editorial history of covering these subjects. A few wonderful leading women actually that make such wonderful original content and programming we love on television come to life. I’d love to share with them the series idea I am working on right now with them. We’d obviously go to a Persian restaurant hidden inside a pizza shop that I love for their saucy chicken and rice. Allison Page and Courtney White of HGTV and Food Network.